I always find it interesting when musicologists announce they have a previously unknown work by a great composer. This typically happens in one of two ways: either someone finds sheet music that no one was aware of, or they study a known work and decide that it definitely/probably/maybe was written by someone famous. [T]he concerto movement, labeled Molto Allegro, contains a multitude of notes and technically demanding, sometimes awkward, passages. "This is nothing you would use to teach your children," Mr. Leisinger said. It was composed by "someone with high ambitions" but lacking the expertise to write out the music, he said. Mr. Leisinger said an anecdote, recounted by a Mozart family friend shortly after Mozart’s death, provides circumstantial evidence to support his theory. 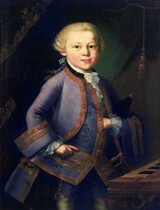 The friend, a trumpet player named Johann Andreas Schachtner, said he and Leopold were looking at a blotchy effort by Wolfgang the child to write down music. "At first we laughed at what seemed such pure gibberish, but his father then began to observe the most important matter, the notes and music," Schachtner recounted. "He stared long at the sheet, and then tears, tears of joy and wonder, fell from his eyes. 'It is so very difficult that no one could play it,' Leopold said. And Wolfgang replied: 'That’s why it’s a concerto. You must practice it till you can get it right.' "
Another expert, not directly involved, finds the new attribution "highly plausible" but doubts we'll ever know for sure. You can listen to the piano piece and the concerto movement here.